Krassimira Garbett, Ph.D., Patricia “Cookie” Minton, R.N., and Kent Shaddox are the recipients of the 2013 Research Staff Awards at Vanderbilt University Medical Center. The annual awards, which recognize laboratory and administrative staff for research excellence, were announced Jan. 10 during a luncheon at the University Club. Vanderbilt’s research enterprise is “built on a foundation of bright, talented, hardworking and devoted research staff like our honorees today,” said Susan Wente, Ph.D., associate vice chancellor for Research and senior associate dean for Biomedical Sciences, who hosted the event. “Their hands and their minds are essential to making these discoveries and to training, which together shape our understanding of biological mechanisms, our understanding of health and our progress in health care,” she said. Garbett, a staff scientist in the laboratory of Karoly Mirnics, M.D., James G. Blakemore Professor and vice chair for Research in the Department of Psychiatry, received the Edward E. Price Jr. Award for Excellence in Basic Research. Family members of Price, a longtime and internationally known research assistant in Biochemistry who died in 2007, attended the luncheon. Minton, research nurse IV in the Division of Allergy, Pulmonary and Critical Care Medicine, received the Vivien Thomas Award for Excellence in Clinical Research, named for the pioneering surgical technician who began his career at Vanderbilt in the 1930s. “She’s a tremendous advocate for science and discovery,” added Hartert, assistant dean for Physician-Researcher Training. Shaddox, laboratory manager of the Jim Ayers Institute for Precancer Detection and Diagnosis, part of the Vanderbilt-Ingram Cancer Center, received the Research Staff Award for Excellence in Contributing to Multi-investigator Teams. He was nominated by institute director Daniel Liebler, Ph.D., in part for his contributions to the development of mass spectrometry methods for targeted analysis of protein biomarkers for cancer. These methods have been distributed nationwide and led to publications in “high-impact” scientific journals. “That’s all been driven by Kent,” said Liebler, Ingram Professor of Cancer Research. 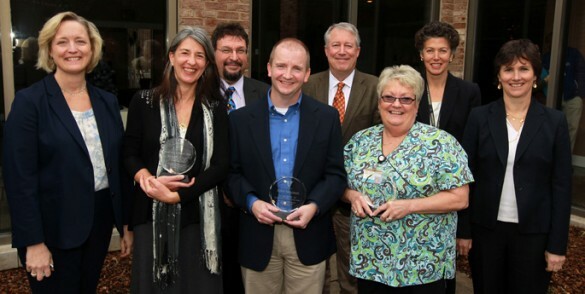 Each Research Staff Award recipient was given an award check and crystal trophy.